Tile making, the symbol of our city and introducer of Kütahya to the world, is an important means of living for the public along with being the most important art branch in Kütahya. 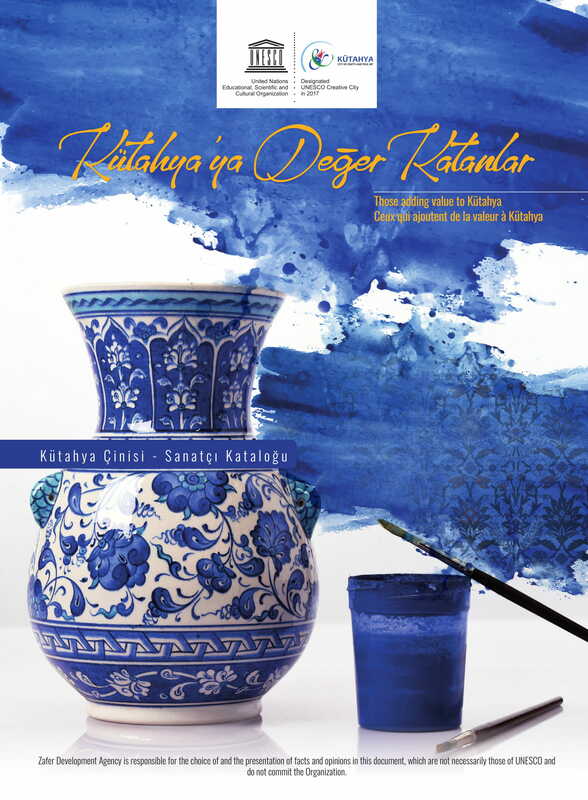 Ceramic production, starting with the Hittites in Kütahya, has shown continuous improvement until the end of the Ottoman period. Kütahya was remained as a buffer zone between Byzantium and Seljuks for more than 100 years. During this period, features of the Byzantine and Seljuk culture were used together in tile making. Afterwards, during the period of beyliks in Kütahya Ottoman influence was started to be seen. It is seen that colored glazed tiles of early Ottoman period were used in the sandbox of Abdülvacit Efendi in the Umur-Bin Savcı Medresa dated 1314 and II. Yakub Bey Tomb dated 1429. The art of 15th century Ottoman ceramics and tiles draw attention with blue white group tiles. This original blue and white tiles are seen in Hisarbey mosque (1487) and Kükürt Village Mosque(l697). Blue and white tiles of 15th century are used in architectural works of İstanbul and Jerusalem along with some of the buildings in Kütahya. In 16th century, even though it was seen that the tile and ceramic based activity in Kütahya is slowed down, Kütahya tiles were used in architectural works of İstanbul and other important centers. 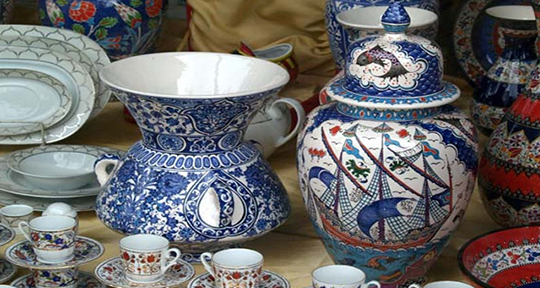 Nowadays Kütahya tiles, which enter among the merchandise exports and gain pattern and color richness, are in a good way. Tiles that produced in nearly 500 workshops with different magnitude ornament many domestic and abroad works. Raw materials used in tiles are provided from Kütahya and neighboring cities. These raw material divided into two as being plastic and non-plastic. Plastic raw materials group: Kırklar soil, Bilecik grey clay, yeast and Mihalıççık clay; and non-plastic group: silex, Bilecik white clay and chalk. With the mixing of these raw materials in certain proportions, three kinds of blends are prepared: impellor, cast and press. In impellor brand, flat wall plates, vases, flower pots and sugar bowls; in cast blend: figurines, cups, plates and ashtrays; in press blend flat or patterned wall tiles are produced.